Posted by dzung do thi on Tháng Tám 27, 2012 in English | Bạn nghĩ gì về bài viết này? 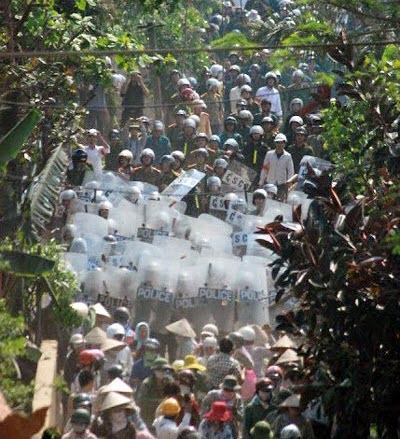 Riot police confront residents of Van Giang. One of the key challenges for urban planners in Vietnam’s major cities lies in understanding and addressing the fundamental gaps between plan and reality. In my research, I have come across planners who speak of planning in Vietnam as a backwards process–where developments start with an assessment of opportunity rather than an assessment of need, economic feasibility or infrastructural costs–in essence, where the plan is always ‘catching up’ to realities on the ground. The problem, as it is articulated by a handful of planning consultants I have interviewed thus far, is that when development starts with an assessment of economic opportunity rather than that of need, it can lead to infrastructural deficiencies, resource management challenges, land and compensation disputes, and unequal access to urban services among a host of other possible problems. Recent news about land disputes and battles over expropriated land and fair compensation in addition to resource management problems are perhaps the most recognizable indicators of this trend. For example, protests in Tien Lang, Can Tho and those associated with the EcoPark project in Hanoi draw attention to the fact that there remains widespread disagreement about how land is valued—particularly in areas that are strategically located for urban expansion. Further, a large number of these urban projects are for luxury-class housing and commercial space. While demand for high-end developments have died down, low income and moderately priced housing remains in high demand, begging the question of just what kinds of debt financing people can afford at each respective city’s median income. Infrastructural planning remains another key issue, as developments which start with opportunity have in many cases overlooked key issues related to water management, water sourcing, power and utilities. As these problems become identified, there are explanations abound. They range from critiques citing a lack of expertise to narratives of corruption. Additionally, technical explanations have accounted for the gap between plan and built environment. Inconsistencies in systems of regulation, organizational/government structure, coordination and/or competition between various agencies and political entities and regimes of urban management have all been cited as playing major roles in producing the rifts we see between plan and built environment. One consultant I spoke with put it very simply: The master plans of Ho Chi Minh City and Hanoi are actually extremely well thought-out documents which incorporate high standards of development, address infrastructural needs and prescribe more equitable and sustainable forms of growth. The challenges these cities face are therefore not for want of a comprehensive and reasonable plan. Rather, their problem lies in the ways incentives are operationalized and the ways in which decisions between agencies, investors and populations are coordinated. For example, districts are rewarded with state resources by demographic growth, and therefore engage in a kind of competition through building new urban centers, new economic area zones and housing projects. Investors interface with planning at the district level, through the acquisition of construction certificates or land use rights, without referencing the mandates put forth by the department of planning and architecture or its master plan. It is in this way that the master plan is in a constant state of revision, to incorporate the unregulated actions of a multitude of development agencies and institutions whose decision-making powers are not centralized under a unitary plan. However, addressing Vietnam’s planning challenges is not simply a question of applying the correct intervention at the right time or weeding out the bad apples from city government. Nor is it a only a technical matter of finding the correct urban management scheme or the right hierarchy of decision making institutions or the correct systems of accountability (even though these things remain important tasks). Rather, the gap between plan and reality is a symptom of larger social, political and economic forces at work which can help us realize the interdependencies and contradictions embedded in development–and in the end, hopefully help planners reframe the issue in a more productive way. Urban theorists exploring trends of late-socialist urbanism in Asia offer some key concepts that might give planners pause to think. They offer that informalities and improvisations of these kinds of developments are not symptoms of a lack of planning. Rather, they are a kind of alternative planning themselves that better reflect a set of realities that traditional planners are reluctant to face, precisely because such activities do not necessarily abide by principles of equitable distribution and balanced/long term development. Urban projects produced under conditions of flexibility and informality remain a key mechanism through which foreign direct investments are captured and capitalized and through which urban developers experiment with different kinds of organizational arrangements, capital flows, land acquisition processes and expressions of equity and distribution. In this sense, informality and uncertainty can be productive forces in the urbanization and economic development of post-transition Vietnamese cities. The productive aspect of this ‘foggy’ regulatory environment is perhaps best seen by examining land and land conversion. There seem to be a myriad of different and conflicting processes by which land is leased and transferred, who has legal claim to land and how land is valued and assessed. Recent protests over evictions indicate that land values remain extremely ambiguous and inconsistent. Some planners indicate that land prior to any improvements (such as infrastructure) should not be subject to speculation. Yet this remains a difficult issue to parse out, particularly when considering peri-urban land that is strategically located close to central business districts. Defining speculation and determining land value remains difficult for a state that seeks to create market conditions for urban growth while maintaining ownership of land and setting land value according to a different set of principles (See the World Bank’s 2009 Policy Note entitled “Improving Land Acquisition and Voluntary Land Conversion in Vietnam”). Yet this lack of consistency allows a great deal of flexibility when considering the needs of a variety of investors and circumstances—here it is important to recognize that private foreign investors engage in an increasingly high-speed regional Asian global market looking for high returns and short term growth, things that perhaps prioritize economic opportunity over questions of need or ideal conditions of distributive justice. It will be interesting to see whether or not such forms of ‘informal planning’ will continue to perpetuate as current market conditions turn and as investment dollars become more scarce. Current debate and reforms to the country’s land law will also play an important role in future urban growth. In the meantime, it is important to recognize the ways in which the growth of Vietnam’s cities (and the growth of a key sector of the national economy) are dependent upon informality and ambiguity as modes of growth and how we can begin to effectively interact with these realities and contradictions as planners. It remains equally important for planners to recognize how economic development under this model poses serious challenges to equitable resource distribution, sustainability and long term development. For more on “informal planning” and late socialist “exceptionalism” see: 1) Roy, Ananya. “Why India Cannot Plan Its Cities: Informality, Insurgence and the Idiom of Urbanization.” Planning Theory 8, no. 1 (February 1, 2009 2009): 76-87. 2) Ong, Aihwa. Neoliberalism as Exception : Mutations in Citizenship and Sovereignty. Durham [N.C.]: Duke University Press, 2006. 3) Sturgeon, Janet, and Thomas Sikor. “Post-Socialist Property in Asia and Europe: Variations on ‘Fuzziness’.” Conservation and Society 2, no. 1 (2004): 1-17. 4) Hsing, You-tien. The Great Urban Transformation Politics of Land and Property in China. Oxford ; New York: Oxford University Press. 2010. Some claims made here on questions of land value, land disputes, housing reform and state role in land/housing markets are based on the following: 1) Dang Hung Vo and the World Bank. “Policy Note: Improving Land Acquisition and Voluntary Land Conversion in Vietnam.” World Bank, 2009. 2) Gillespie, John. “Exploring the Limits of the Judicialization of Urban Land Disputes in Vietnam.” Law & Society Review 45, no. 2 (2011): 241-76. And “The Role of Bureaucracy in Managing Urban Land in Vietnam.” Pacific Rim Law and Policy Journal 5.1 (1995): 59-124. 3) Yip, Ngai-ming and Hoai-anh Tran. “Urban Housing Reform and State Capacity in Vietnam.” The Pacific Review 21, no. 2 (2008/04/24 2008): 189-210. 4) Tran, Hoai-Anh, and Ngai-Ming Yip. “Caught between Plan and Market: Vietnam’s Housing Reform in the Transition to a Market Economy.” Urban Policy and Research 26, no. 3 (2008/09/01 2008): 309-23.For more on ambiguity and uncertainty as modes of governance, see: 1) Gainsborough, Martin. Vietnam : Rethinking the State. London; New York; Chiang Mai, Thailand: Zed ; Silkworm Books. 2009.